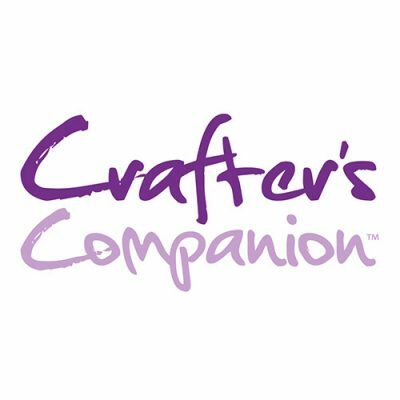 Crafters Companion > Blog > How to use our stamping platforms – press to impress! Stamping is a craft that is loved by people of all ages – there are plenty of stamping kits for kids on the market and grown up crafters love stamping details on to their projects – but lots of people still haven’t discovered the amazing precision that can be achieved through our stamping platforms. 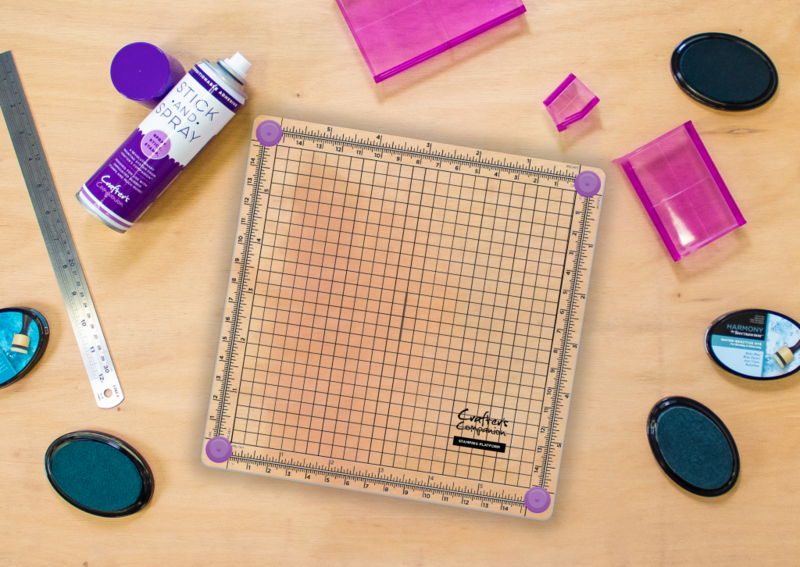 You may by reading this post thinking, “why would I need a stamping platform if I can just mount my stamps and craft away?” Let us explain how these tools work and show you the amazing results that can be achieved with them! What are stamping platforms for? The purpose of our stamping platforms is to help you create the most precise images as possible. If you thought you were creating crisp impressions before, just wait until you try them out! What makes them even better is that they’re so simple to use. In our current line of stamping platforms, we have the 4″ x 4″ and the 6″ x 6″. Both of these sizes can be used with a range of unmounted stamps – acrylic, clear, rubber, cling, EZ-mount stamps, whatever you prefer to use! However, they must be unmounted in order to temporarily cling to the surface of the platform. Each platform features our innovative ‘spring-loaded foot’ design to ensure highly detailed stamping every time. These non-slip feet ensure edge-to-edge pressure when you’re pushing your stamp into the material below and their size allows for maximum stamping surface capacity, allowing you to have crisp stamped images on every project. If you want to be even more meticulous, our stamping platforms have also been equipped with a measuring grid in both metric and imperial measurements, giving you the opportunity for precisely perfect placement. Flip your stamping platform over so that the feet are pointing upwards. Take your chosen unmounted stamp and lay it on to the surface. If it is a stamp with a corner, line it up with the central crosshairs, but if it’s an unusual shape, pick a spot using the grid lines that is convenient for you. The stamp should self-cling straight away. Use your chosen ink to add a good coating over the surface of your stamp. If you’re planning on layering, we highly recommend the Spectrum Noir Quick Dry Inkpads! Gently flip the stamping platform on to its right side and position the feet above your material. Press down on to the stamping platform firmly, making sure to apply an even pressure across the surface. Release the pressure to allow the platform to lift from the material, revealing your print below. To remove your stamp, turn the stamping platform over and simply peel your stamp from the surface. Any runaway ink can be wiped away with a piece of damp kitchen towel (but remember to dry the platform, otherwise your next stamp won’t stick). And that’s all there is to it! By following these steps, you can be sure to create lasting impressions that completely steal the limelight. 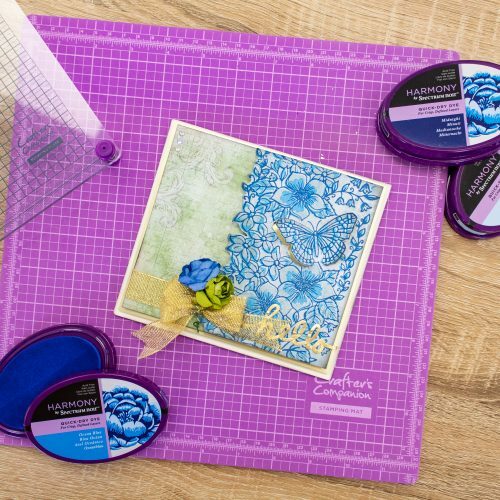 We highly recommend using them with our Floral Layering Stamps! Each stamp in the sets has been equipped with a corner piece, specifically so you can line them up on the stamping platform. Take a look at the video below to see a demonstration from Leann! Now that you’ve learned all about our stamping platforms, have a go and try one out today. 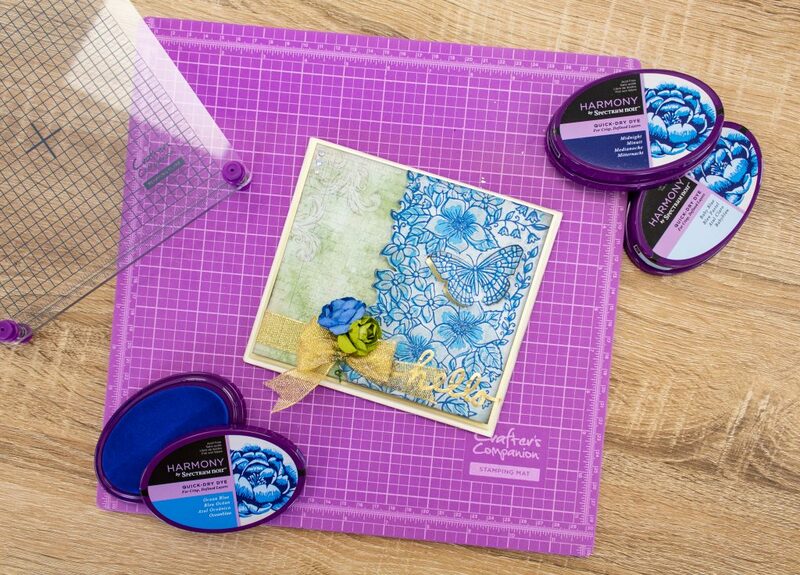 We can’t wait to see all of your stamping project photos on social media!